The Obama administration has taken off the gloves in its war on runaway corporations. On April 4, theTreasury released a new set of rules designed to curb “inversions,” a strategy in which a US company cuts its corporate tax burden by merging with a foreign company and moving its official tax residence out of the United States. The pharmaceutical giants Pfizer and Allergan immediately announced that they would abandon their pending mega-billion inversion deal. So tonight, I’m asking Democrats and Republicans to simplify the system. Get rid of the loopholes. Level the playing field. And use the savings to lower the corporate tax rate for the first time in twenty-five years—without adding to our deficit. It can be done. When I look at the details, I see the same rigged game, a game where Congress hands out billions in benefits to well-connected corporations, while people who really could use a break. . . are left holding the bag. Only one problem with the over-taxation story: It’s not true. There is a problem with the corporate tax code, but that isn't it. It's not that taxes are far too high for giant corporations, as the lobbyists claim. 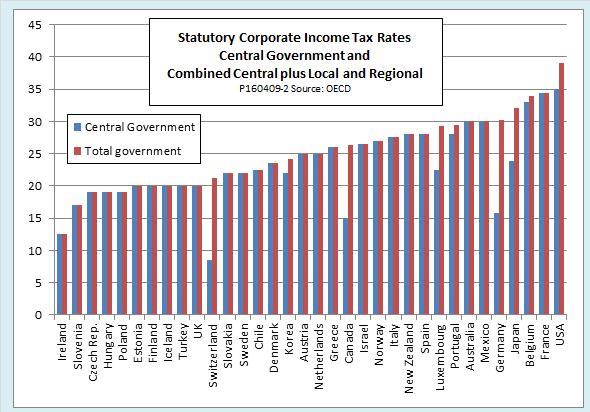 No, the problem is that the revenue generated from corporate taxes is far too low. In my opinion, the Obama of 2011 was right, while Warren, and the Obama of 2016, are wrong. Here is why real corporate tax reform—preferably the complete abolition of the corporate income tax—is a cause that progressives should embrace as enthusiastically as do conservatives. 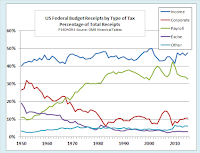 Who bears the burden of the corporate income tax? Not corporations as such, which are legal entities that can feel no pain. One way or another, the economic burden of the corporate tax must fall on corporations’ human stakeholders—shareholders, creditors, workers, or customers. Determining the exact incidence of the corporate tax is tricky. A 2011 report from the Urban Institute provides a good summary of the issue. Beginning in the 1960s, it says, economists concluded that essentially all the burden fell on shareholders. That became the standard approach for reporting the distribution of the tax burden among the population. The Congressional Budget Office and other official agencies continue to use that assumption. More recent studies, however, indicate that growing globalization of business has changed things. 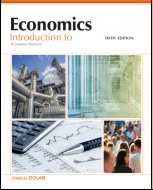 The early studies were based on closed-economy models. In contrast, today’s world is one of open economies, where not just goods and services, but also factors of production, can move from one country to another. In a globalized world, tax avoidance is a major motivator of international factor flows. And although both capital and labor are mobile to a degree, capital is much more mobile, and therefore more successful at avoiding taxes. As capital flows to countries where corporate tax rates are low, the amount invested per worker in high-tax countries falls. 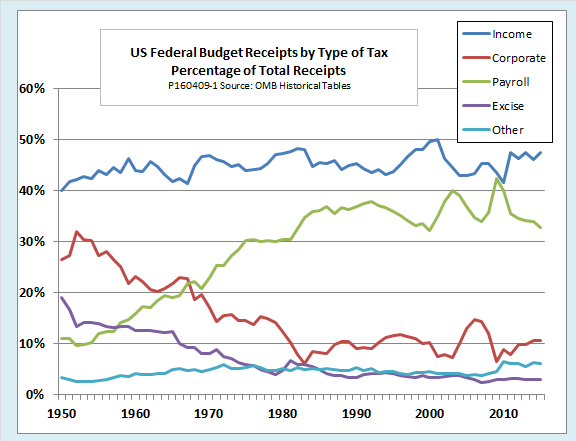 The decrease in investment shifts the burden of corporate taxes to workers. The classic assumption is that it does so mainly through lower wages, but (as explained in this earlier post), where there are frictions in domestic labor markets, displaced workers do not immediately find work even at lower wages. Extended jobless spells add to the burden on labor. Exactly how much of the total burden is shifted is hard to tell. Maybe all, maybe 70 percent, maybe half. The shift may vary over time and from one industry to another. In any case, the hypothesis that shareholders bear the full burden of the corporate income tax is increasingly unrealistic. The standard assumption that corporate taxes fall entirely on shareholders leads to overstatement of the share of taxes paid by high-income groups. For example, consider an estimate published by the Tax Policy Center, which uses the standard assumption. The Center estimates that the top-earning 1 percent of taxpayers pay an average of 28 percent of their income in federal taxes, compared to 18.9 percent for the middle 20 percent. 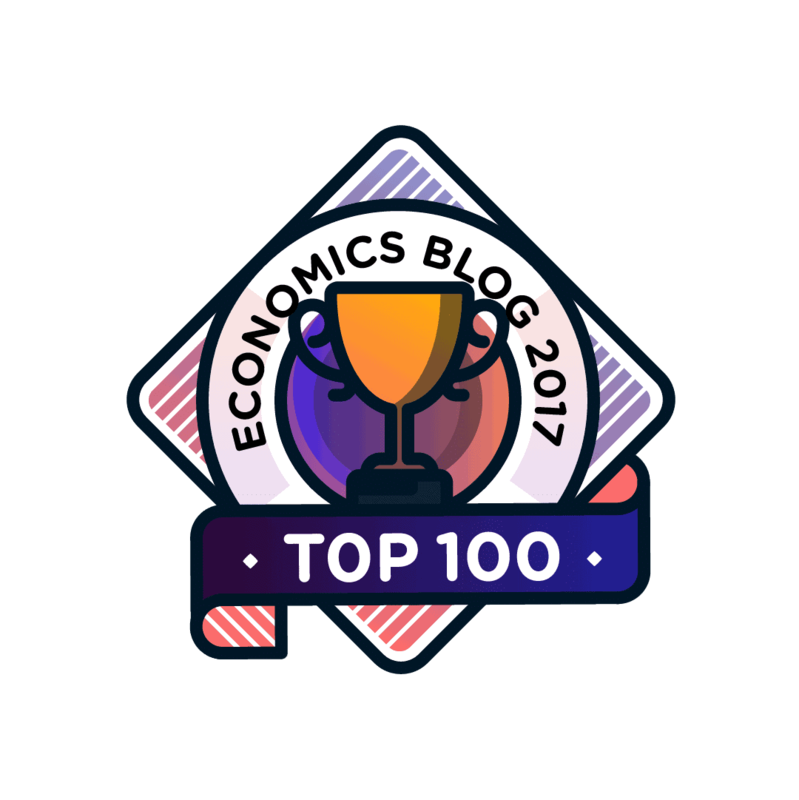 However, the 28 percent figure for the top 1 percent includes a corporate tax component of 7.9 percent. What happens if we assume that component falls on labor income, instead of on income to shareholders? Labor income constitutes 93 percent of all income for the middle 20 percent of taxpayers, but just 45 percent for the top 1 percent. Shifting the assumed incidence of the corporate tax from shareholders to workers would reduce the gap in tax rates between the top 1 percent and the middle 20 percent by at least half. That would make the US tax system quite a bit less progressive than standard data indicate. In short, the idea that the corporate tax is a tax on the rich is largely an illusion. Politicians on both the left and the right like to rally their base by pretending it is a tax on capital, but capital skips away to low-tax jurisdictions, leaving workers with fewer jobs and lower wages. 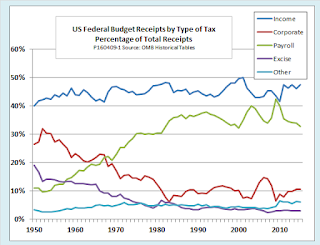 In the early 1950s, the corporate tax accounted for nearly a third of all federal revenues. Today, it brings in barely a tenth, as the following chart shows. But here is the puzzle: If the corporate tax brings in so little revenue, and if shareholders can shift the burden of what remains to workers, why do business leaders hate it so much? The answer is that the burden of the tax is much larger than it appears to be, if we look only at the revenue the tax brings in. We need also to account for the financial, administrative, and strategic costs of tax avoidance. Sure, you can lower your tax burden by moving your corporate headquarters to Ireland, but if such a strategy were costless, then everyone would be there by now. In reality, you can avoid taxes only by making locational, operational, and financial decisions that you would not otherwise make—precisely because they are costly. As a hypothetical example, suppose your corporation owes $35 million in tax on $100 million in profit, for a net income of $65 million after tax. By changing your product line, moving your corporate headquarters, and reconfiguring your financing, you can cut your taxes to $10 million. Unfortunately, implementation of those measures incurs administrative costs of $12 million and cuts your revenue by $8 million. You end up with after tax income of just $70 million. Yes, that’s still worthwhile in the sense that you are $5 million better off than if you had just paid your taxes. But what is the true measure of the burden that the US corporate tax system places on your company? Is it the 12.5 percent you pay on your remaining $80 million in before-tax profits, or is it 30 percent—the bite that $10 million in taxes plus $20 million in tax avoidance costs takes out of your original $100 million? Obviously, it is the latter. In short, tax revenue actually collected is not a complete measure of the degree to which the corporate tax undermines a country’s industrial efficiency and international competitiveness. 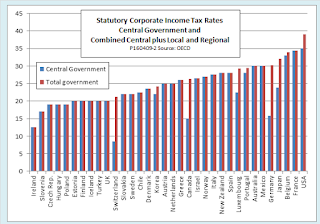 US corporations face the highest statutory corporate tax rates of any OECD country, as the next chart shows. As a result, they have the greatest incentive to engage in costly tax avoidance strategies, the burden of which, like the burden of the taxes themselves, falls largely on American workers. The best way to fix the corporate tax would be to abolish it altogether. Yes, that would leave a hole in the federal budget, but there would be several ways to make up the lost revenue. Any of them would produce fewer distortions to business practices than the corporate tax in its current form. If abolishing the corporate tax altogether sounds too radical, the next best thing would be to broaden its base, lower its rates, and close its loopholes, as President Obama himself advocated just a few years ago. Even modest reforms along those lines could get the U.S. corporate tax down from the highest rate in the world to the OECD average of around 25 percent. That would substantially reduce incentives that have induced companies as diverse as Burger King and Pfizer to look for friendlier homes abroad. All discussions of fair and effective corporate taxation come come back to the problem that corporations are not people. Think of them as more like rats. Rats, with their collapsible skeletons, can squeeze through a hole the size of a quarter. Corporations do much the same. They can move their legal residence to an offshore tax haven quicker than you or I could load a U-Haul trailer to move across town. In fact, they don’t even have to move. They can stay right where they are and shift their profits to offshore subsidiaries using transfer pricing, fees for use of intellectual property, or some other entirely legal gimmick. If not that, they can morph into a limited partnership or a subchapter-S corporation. Corporations as legal entities cannot bear the economic burden of taxes. In a globalized world of mobile capital, the burden both of taxes paid and of costly tax avoidance strategies falls largely on workers. What is there for a progressive not to love in abolition of the corporate income tax? Somehow, though, our Democratic presidential candidates have not grasped this truth. Hillary Clinton backs measures much like those of the Obama administration, which retreat from earlier reform proposals. This ought to be the perfect opportunity for Bernie Sanders to differentiate himself from Clinton, help workers hit by globalization, and show himself to be the true progressive in the race. All he would have to do would be to push for abolition of the corporate tax combined with full taxation of personal investment income. Where is Bernie when we need him? What Happened to Corporate Tax Reform? A question is what sort of increase in upper income tax would be necessary to pay for it, and how can nearly complete tax avoidance be avoided since everything not absolutely necessary will be kept under the corporate umbrella. Other than forced realization, I don't see any way.